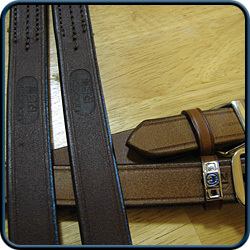 These leather non-strap stirrup leathers put only ONE piece of leather under your legs. REGULAR length, which can be adjusted from 17" to 21" long. Each stirrup has 12 adjustment holes. LONG length, which can be adjusted from 21" to 25" long. Each stirrup has 12 adjustment holes.